I don’t tend to comment on domestic British politics, much of it is uninspiring and would bore a sloth off of a tree. 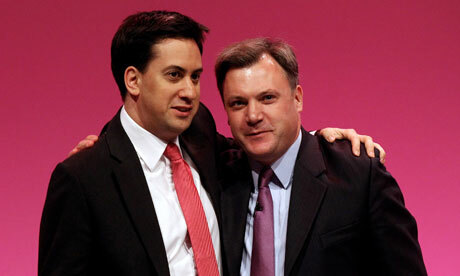 Notwithstanding that, I couldn’t let the much heralded Ed Miliband interview in the New Statesman pass without comment. The British Labour Party cannot, in spite of the obvious unpopularity with the Tories, land a knockout blow, whilst the polling figures are fairly good at CON 33%, LAB 45%, LD 8%, UKIP 6%. Given everyone’s contempt for the Tories and the open booing at the Paralympics you might, not unreasonably, expect an invigorated Labour, just waiting for the opportunity to take power, however, that doesn’t seem to be the case. The charismatically challenged, Ed Miliband, could only manage the feeble wonkish soundbite of “predistribution” in his New Statesman interview. All strikingly unimpressive, as Stumbling and Mumbling pointed out. “So the transatlantic trade in political ideas is always going to be bumpy. Still, there are some items I assume those returning pols have stashed into their hand luggage. For Labour, item one is surely a DVD of the Clinton speech: Ed Miliband should sit down, pen in hand, right away to watch and learn. He would conclude, first, that a politician does not have to talk down to an audience. It is possible to talk seriously. Indeed, if you show the voters you respect them, they’ll respect you. Second, it’s wise to deal with the opposition’s arguments, rather than hoping they’ll go away. Clinton went through the Romney-Ryan chargesheet and tore it apart. Labour must do the same with the persistent claim that it cannot be trusted to run the economy because it overspent last time. It takes effort, but it’s worth it. Reading the comeback interview at New Statesman with Miliband I can’t help thinking not much will improve his poor grasp of politics and lack of appeal. I hope I am wrong. The problem would seem to be Miliband is, sensibly, prepared to drop the New Labour nonsense but haven’t thought of a clear-cut alternative. Most people are disgusted by casino capitalism and how, no matter the outcome, the rich are rewarded more day by day, so whatever Miliband and the Labour Party does I would suggest being bold, like Clement Attlee!